Adams graduated from Sault High School in 1926, received a bachelor’s degree from the University of Michigan in 1930, and his master’s the next year. After three years at home in the family businesses, he enrolled in the University of Michigan Law School, receiving his degree and passing the Bar in 1936. While in law school he formed what turned out to be an important friendship with G. Mennen Williams and other men who were later to become important in Michigan politics. During the same time he formed what was to be an even more long-lasting relationship by marrying Ruth Karpinski, daughter of University of Michigan math professor Louis Karpinski. 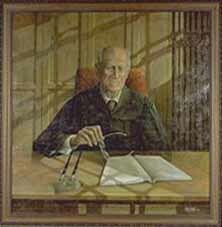 After his law training, Adams returned to the Soo to practice law and perform many different civic roles. He was mayor of Sault Ste. Marie from 1938 until 1942 and served as director of Civilian Defense from 1941 until 1943, just to name a few. He was elected a member of the University of Michigan Board of Regents in 1956, and in 1957 Adams was appointed Michigan Attorney General. He continued to serve as Attorney General until 1962, when Governor John Swainson appointed him to the Michigan Supreme Court.